Mona B. Fold-Over Convertible Tote Bag - P. C. Fallon Co. Fast shipping! The Mona B. Fold-Over Convertible Canvas Tote Bag has many eye-turning features, such as its genuine brown leather handles and accents contrasting the khaki canvas construction. 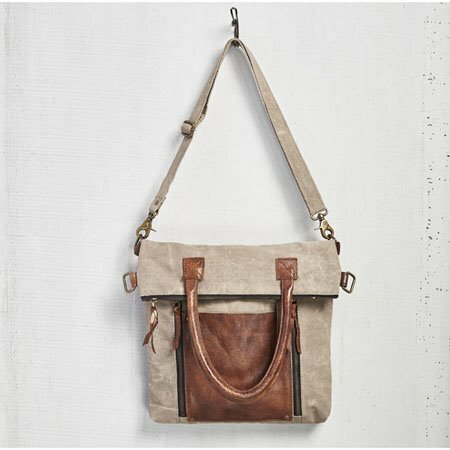 This bag has a detachable woven 12" adjustable shoulder/crossbody strap that can be removed to convert to a tote bag to carry with the leather handles. On the front find a large leather pocket, flanked by 2 zippered compartments. Fold-over flap secured by two magnetic button snaps. Zippered closure at the top. Very versatile and roomy bag, with comfortable style and function. The interior has the signature Mona B. cotton lining, and contains 1 large pocket and 2 slip pockets. Two leather carry handles with 6" drop. Dimensions are 13”w x 18”h. Made from recycled antique military tents and tarps. The fabric shows the history of its travels. Color variations and patches add to the uniqueness of each bag. Heavy cotton canvas trimmed with leather.